The x3850 X5 server is the fifth generation of the Enterprise X-Architecture, delivering innovation with enhanced reliability and availability features to enable optimal performance for databases, enterprise applications, and virtualized environments. Environments that run around the clock to supply information world-wide require dependable servers with features that can tolerate a component failure without total shutdown. The x3850 X5 server packs numerous fault-tolerant and high-availability features into a high-density, rack-optimized package that helps to significantly reduce the space needed to support massive network computing operations. A single x3850 X5 supports up to four of Intel's high-performance 10-core processors and up to 3 TB of memory. Two x3850 X5 servers can be connected together to form a single-system image with up to eight processors and up to 6 TB of RAM. This processing capacity is ideal for large-scale database or virtualization requirements. Note: The x3850 X5 is withdrawn from marketing, effective June 30, 2015. Updated the tables in the Internal drive options section. New part numbers for the mini-SAS to min-SAS cables in the External disk storage expansion section. The x3850 X5 server packs numerous fault-tolerant and high-availability features into a high-density, rack-optimized package that helps to significantly reduce the space needed to support massive network computing operations. A single x3850 X5 supports up to four of the new Intel Xeon E7 high-performance 10-core processors and up to 3 TB of memory. Two x3850 X5 servers can be connected together to form a single-system image with up to eight processors and up to 6 TB of RAM. This processing capacity is ideal for large-scale database or virtualization requirements. Figure 1 shows the System x3850 X5. The x3850 X5 is an ideal server for enterprise database and virtualization workloads. The x3850 X5 held #1 scores in five industry-standard benchmarks. This included a four-socket TPC-C (database benchmark) result of over 2.3 million transactions per minute (27% better than the closest HP result at the time) and world record TPC-H (business intelligence) price performance result. The x3850 X5 is a mission-critical 4U four-socket server, capable of expanding to up to 8 processor sockets and 6 TB of memory in 10U of rack space. It offering outstanding performance, and superior reliability and fault-tolerant memory characteristics. 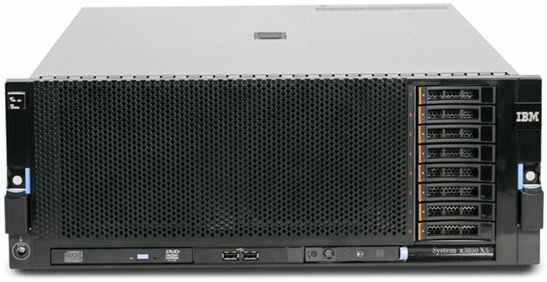 Lenovo eX5 technology represents the fifth generation of enterprise servers based on the same design principle that began with in 1997: to offer systems that are expandable, offer “big iron” reliability, availability, and serviceability (RAS) features, with extremely competitive price/performance on an Intel Xeon processor-based system. The x3850 X5 supports up to four high-performance Intel Xeon E7 family allowing you to upgrade as business needs require. Scalable to eight processors by connecting two x3850 X5 servers together to form a single system image. Each x3850 X5 scalable to 2 TB of memory internally or 3 TB of memory with the addition of the MAX5 V2 memory expansion unit. With two x3850 X5 servers each with MAX5 units, the total available system memory is up to 6 TB. Each processor includes two integrated memory controllers, to reduce memory bottlenecks and improve performance. Memory access is at up to 1066 MHz frequency, depending on the processor model and memory used. The MAX5 V2 adds an additional four memory controllers for a total of eight memory controllers to maximize memory parallelism and performance. In processors implementing Hyper-Threading technology, each core has two threads capable of running an independent process. Thus, an 8-core processor can run 16 threads concurrently. Intel’s Virtualization Technology (VT) integrates hardware-level virtualization hooks that allow operating system vendors to better utilize the hardware for virtualization workloads. 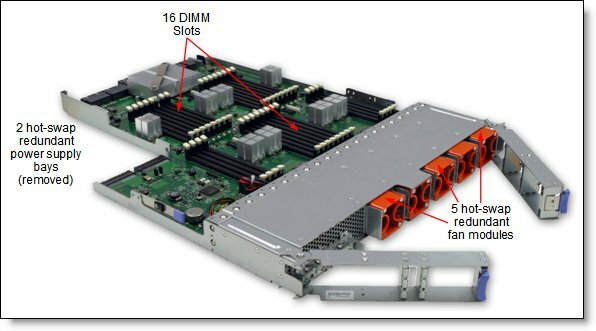 Up to 64 DIMM sockets in the server (eight per memory card), plus an additional 32 DIMMs with an optional 1U MAX5 V2 memory expansion unit, for a total of 96 DIMM sockets. With two x3850 X5 servers each with MAX5 units, the total number of DIMM sockets is 192. The use of solid-state drives (SSDs) instead of, or along with, traditional spinning drives (HDDs) can significantly improve I/O performance. An SSD can support up to 100 times more I/O operations per second (IOPS) than a typical HDD. Up to 24 1.8-inch SSD bays, or up to 16 2.5-inch bays together with the option of an optical drive, provide a flexible and scalable all-in-one platform to meet your increasing demands. Support for machine check architecture (MCA) recovery, a feature of the Intel Xeon processor E7 family, which enables the handling of system errors that otherwise require the operating system to be halted. SAP HANA is one of the first application which leverages the MCA recovery to handle system errors in order to prevent the application from being terminated in case of a system error. Extensive memory protection with Chipkill, and, with DIMMs containing x4 DRAM modules, Redundant Bit Steering (RBS) (also known as Double Device Data Correction or DDDC) is also supported . The combination of Chipkill and RBS provides very robust memory protection that sustains to two sequential memory DRAM chip failures without affecting overall system performance. Redundant CPU-to-I/O hub interconnect links provide ability to self-recover from CPU failure. If primary CPU fails then eX5 systems can use the second CPU to boot the OS as they still have access to the integrated I/O devices because of redundant links between CPUs and I/O hubs. Single image 8-way systems consisting of two interconnected 4-way nodes provide self-healing capabilities in case of single node failure. Two independent nodes form a resilient 8-way configuration. In case of single node failure the system can be restarted in degraded mode thus eliminating unexpected downtime that requires service specialist to recover. Memory mirroring and memory rank sparing for redundancy in the event of a non-correctable memory failure. 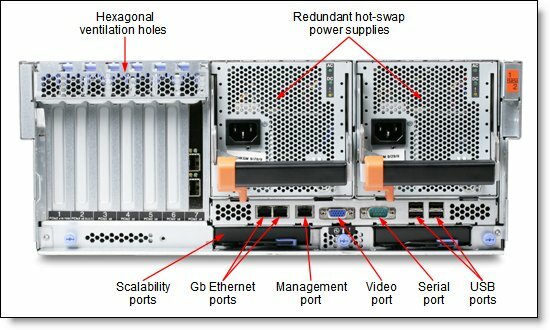 Hot-swap drives, supporting RAID redundancy for data protection and greater system uptime. Two 1975 W hot-swap power supplies and five fans (three hot-swap, two integrated into the power supplies). The power source independent light path diagnostics panel and individual light path LEDs quickly lead the technician to failed (or failing) components, which simplifies servicing, speeds up problem resolution, and helps improve system availability. Predictive Failure Analysis (PFA) detects when system components (processors, VRMs, memory, HDDs, fans, and power supplies) operate outside of standard thresholds and generates proactive alerts in advance of a possible failure, therefore increasing uptime. Solid-state drives (SSDs) offer significantly better reliability than traditional mechanical HDDs for greater uptime. Built-in Integrated Management Module (IMM) continuously monitors system parameters, triggers alerts, and performs recovering actions in case of failures to minimize downtime. Built-in diagnostics, using Dynamic Systems Analysis (DSA) Preboot, speed up troubleshooting tasks to reduce service time. Three-year customer-replaceable unit and on-site limited warranty, 9x5 next business day. Optional service upgrades are available. The server includes an Integrated Management Module (IMM) to monitor server availability and perform remote management. IBM Systems Director is included for proactive systems management. It offers comprehensive systems management tools that help to increase uptime, reduce costs, and improve productivity through advanced server management capabilities. Support for one or two or four highly efficient 675 W ac power supplies allows for efficient use and scalability to meet the power requirements of the installed components. Intel Xeon processor E5-2600 product family offers significantly better performance over the previous generation while fitting into the same thermal design power (TDP) limits. Low-voltage 1.35 V DDR3 memory RDIMMs consume 15% less energy compared to 1.5 V DDR3 RDIMMs. Solid state drives (SSDs) consume as much as 80% less power than traditional spinning 2.5-inch HDDs. The server uses hexagonal ventilation holes, which is a part of Calibrated Vectored Cooling™ technology. Hexagonal holes can be grouped more densely than round holes, providing more efficient airflow through the system. IBM Systems Director Active Energy Manager™ provides advanced data center power notification and management to help achieve lower heat output and reduced cooling needs. Figure 2 shows the front of the server with the front bezel removed. Figure 3 shows the rear of the server. The x3850 X5 supports the addition of the MAX5 memory expansion unit. This 1U device is cabled directly to the server and provides an additional 512 GB of memory capacity for applications that can benefit from the extra RAM. Figure 5 shows the MAX5 optional memory expansion unit. Form factor/height Rack/4U per chassis; MAX5 adds 1U. Processor type Machine type 7143: Intel Xeon E7-8800 and E7-4800 families, up to 10 cores. Number of processors Most models: 2 standard (some 4 standard); 4 maximum. Memory DIMM sockets Up to eight memory cards, each with eight DIMM sockets (64 DIMM sockets total). MAX5 adds 32 DIMM sockets. Memory maximums 2.0 TB using 32 GB DIMMs. Up to 3.0 TB with the addition of MAX5. Seven PCIe 2.0 slots (one used by 10 Gb Ethernet card, if included). One PCIe 2.0 slot for supported RAID card. Disk bays Eight 2.5" hot-swap SAS or sixteen 1.8" solid-state drives (SSD). Network interface Two 1 Gb Ethernet ports. Broadcom 5709C controller. Hot-swap components Power supplies, fans, hard disk drives, and solid-state-drives. Systems management Alert on LAN 2, Automatic Server Restart, IBM Systems Director, ServerGuide, Integrated Management Module (IMM), light path diagnostics (independently powered), Predictive Failure Analysis on hard disk drives, processors, VRMs, fans and memory, Wake on LAN, Dynamic System Analysis, QPI Faildown. Limited warranty Three-year customer-replaceable unit and onsite limited warranty. ‡ Columns indicate whether the server can scale to two nodes without a MAX5 attached and with a MAX5 attached. * The number in brackets is the number of memory cards standard in each model. Up to eight cards are supported. Each holds up to eight DIMMs for a total of 64 DIMMs. The MAX5 adds 32 DIMM sockets for a total of 96 DIMMs. The following table lists the announced workload-optimized models. These are all named System x3950 X5 to distinguish them from base x3850 X5 models, even though the base hardware is the same. These are systems that are specially configured to meet the requirements of a particular software stack. ** Processor detail: Quantity, model, cores, core speed, memory speed, L3 cache. * The number in brackets is the number of memory cards standard in each model. Up to eight cards are supported. Each holds up to eight DIMMs for a total of 64 DIMMs. The MAX5 adds 32 DIMM sockets for a total of 96 DIMMs. † The H models include one Emulex 10GbE Integrated Virtual Fabric Adapter (with two 10GbE SW SFP+ Transceivers), one Emulex 10GbE Virtual Fabric Adapter II (with two 10GbE SW SFP+ Transceivers), and one Intel Ethernet Quad Port Server Adapter I340-T4 for a total of four 10Gb ports and six 1Gb ports. All F models include one Emulex 10GbE Integrated Virtual Fabric Adapter. D3x and D4x models include one Emulex 10GbE Integrated Virtual Fabric Adapter II. ‡ Models HCx and HEx include the QPI Scalability Kit (four cables), part number 46M0072. Use model HBx plus HCx or HDx plus HEx to form a 2-node scaled complex. Models 7143-D3x, D4x: These models are designed for database applications and use solid state drives for the best I/O performance. Backplane connections for sixteen 1.8-inch solid state drives (SSD) are standard, as are sixteen 200 GB high-performance solid-state drives. Model D3x includes two SSD host bus adapters. Model D4x includes four ServeRAID M5015 RAID controllers with four ServeRAID M5000 Series Performance Accelerator Keys. Models 7143-HAx, HBx, HCx: These models are optimized to run the SAP High-Performance Analytic Appliance (HANA) solution. The x3950 X5 Workload Optimized Solution for SAP HANA is an integrated, ready-to-run, hardware-software offering, featuring the new SAP HANA software. Models HDx and HEx are specifically designed for SAP Business Suite, powered by SAP HANA (OLTP) workloads. Models HAx, HBx, HDx include a preload comprising SLES for SAP, IBM GPFS, and the SAP HANA software stack. HCx, HEx are add-on models designed to be connected to model HBx or HDx system respectively to form an eight-processor system. HCx and HEx include the four QPI cables necessary to join two systems together to form a two-node complex. HCx and HEx also include the additional GPFS software and SLES licenses to cover the extra four sockets, but do not include any preload because the are designed as an add-on to the HBx and HDx offerings respectively. All H models include either 256 GB, 512 GB or 1024 GB of RAM, SAS disk drives, and a high IOPS solid-state storage PCIe adapter. Model 7143-F1x, B9x: These models are designed for virtualization applications and include VMware ESXi 4.1 Update 1 on an integrated bootable USB memory key. The model comes standard with the MAX5 memory expansion unit and 384 GB of memory implemented using 4GB memory DIMMs (256 GB in the server and 128 GB in the MAX5). F1x is available world-wide and includes a MAX5 V2, 88Y6529. Model B9x is for China only and includes a MAX5 V2, 88Y6529. Model 7143-F2x: This model is designed for Open Virtualization and includes Red Hat Enterprise Linux with the Red Hat Enterprise Virtualization Hypervisor (Kernel-Based Virtual Machine, KVM). The software is not preloaded. The model comes standard with the MAX5 memory expansion unit and 384 GB of memory implemented using cost-effective 4GB memory DIMMs (256 GB in the server and 128 GB in the MAX5). Refer to the Standard Specifications section for information about standard features of the server. In the x3850 X5, QPI links are used for interprocessor communication both in a single-node system and in a two-node system. They are also used to connect the system to a MAX5 memory expansion unit. In a single-node x3850 X5, the QPI links connect in a full mesh between all CPUs. To complete this mesh, the QPI wrap card is used. QPI wrap cards are installed in sockets where the scalability cables are installed. The QPI wrap cards are only for single-node configurations with three or four processors installed and only when a MAX5 unit is not installed. Two QPI wrap cards are needed. 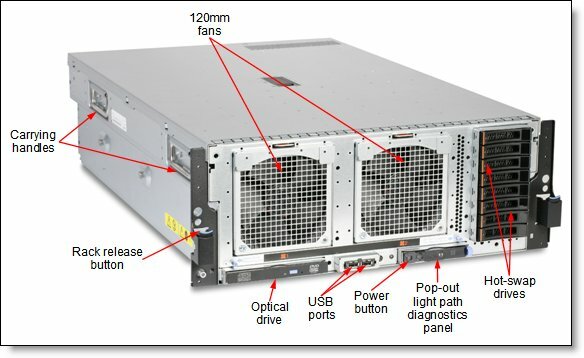 The MAX5 memory expansion unit is a 1U device and has 32 DDR3 DIMM sockets, two 675-watt power supplies, and five 40 mm hot-swap speed-controlled fans. It provides added memory and multinode scaling support for the x3850 X5 server. Some models include the MAX5 standard, as listed in Tables 2 and 3. MAX5 options are listed in the following table. There are two MAX5 options available. Both x3850 X5 machine types (7143 and 7145) support both MAX5 options, provided the firmware is at least UEFI level G0E171T/A. When used with the x3850 X5 machine type 7143 (Intel Xeon E7-4800 and E7-8800 series processors), MAX5 V2 supports low-voltage (operating at 1.35V DIMMs). Note that some models and some processors do not support the MAX5. See the model table and the processor options table for details. The MAX5 V1 includes one power supply. The second power supply is optional (part 60Y0332) and provides redundancy. The MAX5 V2 includes two power supplies; no additional power supplies are needed or available. A single x3850 X5 server with four processor sockets. This configuration is sometimes referred to as a single-node server. A single x3850 X5 server with a single MAX5 memory expansion unit attached. This configuration is sometimes referred to as a memory-expanded server. Two x3850 X5 servers connected together to form a single-image eight-socket server. This configuration is sometimes referred to as a two-node server. Two x3850 X5 servers connected together to form a single-image eight-socket server with two MAX5 memory expansion units attached. This configuration is sometimes referred to as a two-node memory-expanded server. Only machine type 7143 supports this configuration. The following table lists the cable options needed when scaling. Note that not all processors and models support all of these configurations - see the Processor options section below for details. The x3850 X5 supports the processor options listed in the following table. The server supports up to four processors. The E7-8000 processors support native QPI scaling to two nodes without the need for a MAX5 memory expansion unit. All Intel Xeon E7 processors support two-node scaling with MAX5. Two-node scaling with MAX5 is supported with MAX5 V2 for System x (88Y6529) or MAX5 for System x (59Y6265). * Supports MAX5 V2 for System x (88Y6529) or MAX5 for System x (59Y6265). The System x3850 X5 supports DDR3 memory. Memory is installed in memory cards. The server supports eight memory cards, and each card holds eight DIMMs. Two memory cards are connected to each processor. As a result, all eight memory cards are usable only when all four processors are installed. Adding a MAX5 memory expansion unit to the server offers an additional 32 DIMM slots for a total of 96 DIMM slots per node. The following table lists the memory options that are supported in the server and MAX5 (either MAX5 V2 or MAX5). In the MAX5 memory expansion unit, do not mix DIMMs with x4 technology (DIMMs with DRAMs that are organized with 4 data lanes, as indicated by "x4" in the description) with DIMMs with x8 technology (DIMMs with DRAMs that are organized with 8 data lanes). In the server, you can mix DIMMs with x4 and x8 technology. The server supports either up to eight 2.5" drives or up to 16 1.8" drives internally. The number of drives that can be inserted depends on the backplanes that are installed. Backplane options are listed in the following table. The backplanes that are standard in each model are listed in the Standard models section. The following tables list the hard drive options available for internal storage. 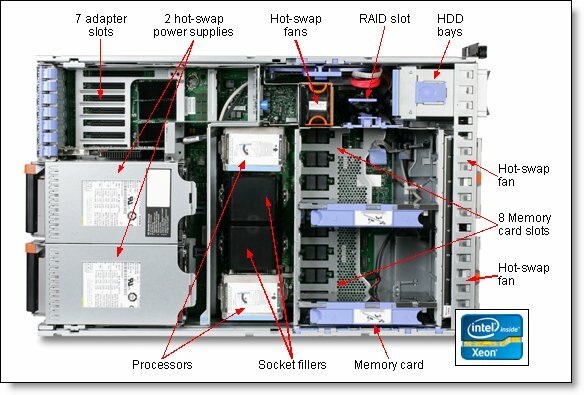 The following table lists the RAID controllers, SAS HBAs and additional options used for internal disk storage of x3850 X5 server. † Only one key is supported in each controller, either the Advance Feature Key or the Performance Accelerator Key. The ServeRAID M5016 Battery Tray, 90Y4304, is used to house the M5016 power module remotely from the controller. The tray replaces the existing tray supplied with the server and supports up to two power modules. Only one ServeRAID M5016 Battery Tray can be installed in the x3850 X5. The server does not support an internal tape drive option. The server offers the following PCI Express 2.0 slots. None are hot-swap. The server has an additional PCI Express slot dedicated to the BR10i RAID controller if installed. Note: The use of slots 1 - 4 requires that a second processor be installed. x3850 X5 offers two integrated Gigabit Ethernet ports, based on the Broadcom BCM5709C controller. Most models also have an Emulex 10GbE Integrated Virtual Fabric Adapter II for System x (feature A148) installed as standard in slot 7. See Table 2 for specifics. This adapter is functionally identical to the Emulex 10Gb Virtual Fabric Adapter II for System x, 49Y7950. The difference is that the integrated adapter has a longer edge connector, meaning that the card can only be installed in this server. The following table lists storage HBAs supported by the x3850 X5 server. The server supports up to two redundant hot-swap power supplies, providing N+N redundancy. Most standard models come with two power supplies (Table 2). The MAX5 power subsystem consists of two hot-pluggable 675 W power supplies, designed for N+N (fully redundant) hot-swap operation. The MAX5 V1 has one power supply standard and a second optional power supply for redundancy. See the MAX5 section for details. The MAX5 V2 has two power supplies installed. No further power supplies are needed or available. An AC power supply ships standard with one 2.8 m C13 - C14 power cord. The server supports VMware ESXi installed on a USB memory key. The key is installed in a USB socket inside the server. The following table lists the virtualization options. The server contains Integrated Management Module (IMM), which provides advanced service-processor control, monitoring, and an alerting function. If an environmental condition exceeds a threshold or if a system component fails, the IMM lights LEDs to help you diagnose the problem, records the error in the event log, and alerts you to the problem. The IMM also provides a virtual presence capability for remote server management capabilities. Note: The noise emission level stated is the declared (upper limit) sound power level, in bels, for a random sample of machines. All measurements made in accordance with ISO 7779 and reported in conformance with ISO 9296. The system has a three-year warranty with 24x7 standard call center support and 9x5 Next Business Day onsite coverage. Also available are Lenovo Services warranty maintenance upgrades and post-warranty maintenance agreements, with a well-defined scope of services, including service hours, response time, term of service, and service agreement terms and conditions. On-site service A service technician will arrive at the client’s location for equipment service. 9x5x4 hour A service technician is scheduled to arrive at the client’s location within four business hours after remote problem determination is completed. Lenovo provides service 8:00 am - 5:00 pm in the client's local time zone, Monday-Friday, excluding Lenovo holidays. For example, if a customer reports an incident at 3:00 pm on Friday, the technician will arrive by 10:00 am the following Monday. Committed Repair Problems receive priority handling so that repairs are completed within the committed time of 6, 8, or 24 hours. Lenovo provides service 24 hours/day, every day, including Lenovo holidays. Lenovo’s Hard Disk Drive Retention (HDDR) service is a multi-drive hard drive retention offering that ensures your data is always under your control, regardless of the number of hard drives that are installed in your Lenovo server. In the unlikely event of a hard drive failure, you retain possession of your hard drive while Lenovo replaces the failed drive part. Your data stays safely on your premises, in your hands. The Hard Drive Retention service can be purchased in convenient bundles with our warranty upgrades and extensions. RTS provides comprehensive technical call center support for covered servers, storage, operating systems, and applications. Providing a single source for support of hardware and software issues, RTS can reduce problem resolution time, decreasing the cost to address technical problems and increasing uptime. Offerings are available for Windows, Linux, IBM Systems Director, VMware, Microsoft business applications, and Lenovo System x storage devices, and IBM OEM storage devices. The following table lists the external SAS disk storage expansion enclosures that are available. The external SAS cables listed in the following table are supported with EXP2512 and EXP2524 expansion enclosures and M5025 RAID controllers. * Note: The EXP2500 series can be chained with each other. In such a case, one cable is used to connect first EXP25xx or EXP3000 to the RAID controller, and every consecutive EXP unit is connected to the previous one by one cable. The RAID controllers listed in the following table are supported with the EXP2512 and EXP2524 external expansion enclosures. The following table lists the external backup options that are offered by Lenovo. The server supports the rack cabinets listed in the following table. TPC, TPC-C, and TPC-H are trademarks of Transaction Processing Performance Council.